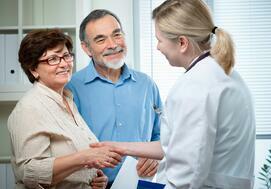 Being a hospital patient can be a stressful and scary experience for both patient and family. The patients find themselves pulled from their comfort zone and can easily feel separated from loved ones during their stay. Their most intimate experiences are now shared with complete strangers. Although there is no substitution for the patient’s own home and environment, the hospital experience can be improved by understanding how patients interact with the physical environment. Four years ago, my mother was diagnosed with thoracic cancer. Undergoing treatment on an outpatient basis, she was under great care and treated by some of region’s best oncologists at a well-known local cancer center. Unfortunately, after completing her radiation therapy and upon further testing, we were told the tumor had increased in size. My mother was then admitted to the hospital while her physicians contemplated alternate methods and potential surgery as her health was in a desperate state. During her stay, both my mother and our family experienced the role the physical environment played on her wellbeing and on our emotional state at the time. 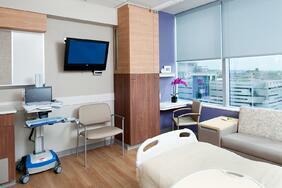 The existing inpatient environment was one that had not been updated or thought about since the facility was built. The inpatient oncology facilities were extremely limited and not at the same level of care as the research and outpatient programs. The rooms were undersized and outdated. There was no capacity or provisions for visitors, and the rooms were distant from the nursing staff, which created a feeling of isolation. Ultimately, the need for a prolonged stay and physical conditions of the inpatient setting created a lack of comfort and confidence for mom and our family. As a healthcare design professional for more than 20 years, and while studying and implementing various design strategies to improve the patient experience, nothing prepared or educated me more than my direct personal experience. I share this personal story with you because I truly believe this experience helped shaped my view on how I approach inpatient room design. At Array, we have worked diligently over the last few years to create a unique approach and process I believe will truly align and enhance experiences our projects will create. As healthcare architects, weaving our own healthcare experiences into project design contributes to enhancing the places, process and people our healthcare projects will surely touch.